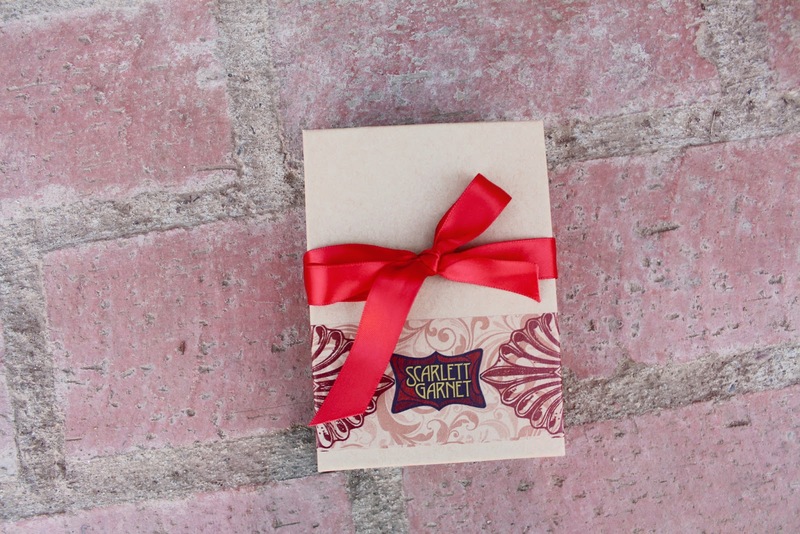 I am so excited to be partnering with Scarlett Garnet Jewelry to bring you this lovely giveaway! The journey of Scarlett Garnet began in 2006, when Katie Miller and Garnet Griebel decided to become a team. Katie lived in Charleston, SC while Garnet lived in Kansas City, MO, but the miles could never stop them from producing beautiful jewelry. They would communicate solely through emails and by phone. In 2007, Katie moved back to Saint Louis, which is when they first met in person. There is still some distance between these two creative geniuses but they still manage to make it work. Their story is amazing, and shows us that the sky is the limit. Scarlett Garnet jewelry is the perfect example of beautiful craftsmanship! Their pieces are so detailed and unique. They can be worn all year round, and go well with so many different outfits! 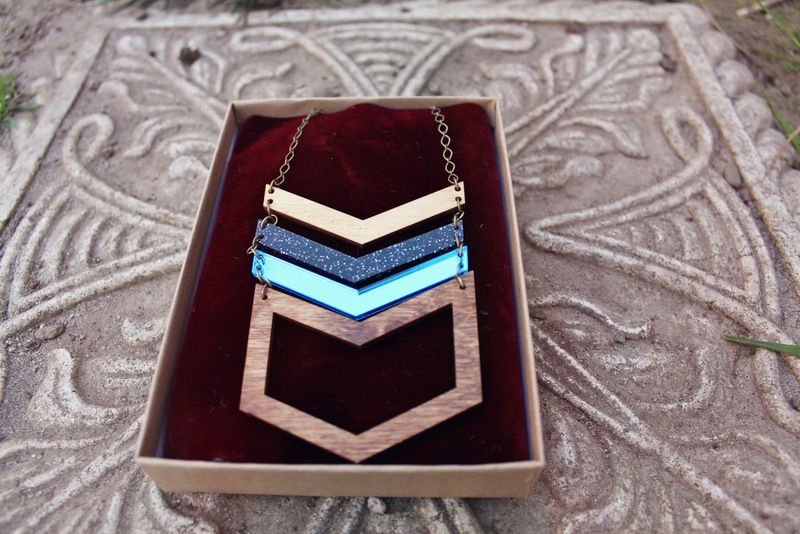 I am absolutely in love with this Wood and Acrylic Chevron Necklace! This is a statement necklace that everyone needs in their jewelry box! I love the pop of color that the blue acrylic gives. The materials that it is paired with are perfect! I was also amazed by the beautiful packaging that their pieces are shipped in. Yet another gorgeous detail! Thanks to Scarlett Garnet, one of my lovely readers will win this gorgeous necklace! 1) Be a follower of Little Red Bowtalk (on Google Friend Connect or Bloglovin). 2) Visit Scarlett Garnet and leave a comment below with your favorite piece from their shop. Little Bowtalk readers also get 15% off at the Scarlett Garnet Etsy shop with code: BOWTALK at checkout! This giveaway is open to U.S. and International readers! Entries will be accepted until Wednesday, March 20. The winner will be chosen at random and will be announced shortly after. Good luck! I love the sly fox as well as the multi-chevron! PS You are a doll! i love the multi metal chevron earrings! i also followed scarlett garnet on twitter! i just found your blog you are adorable!!! love the chevron multi metal necklace!! Also I'm following on IG. I love your skirt 🙂 I'm already following you and I love the bow & arrow earrings!! 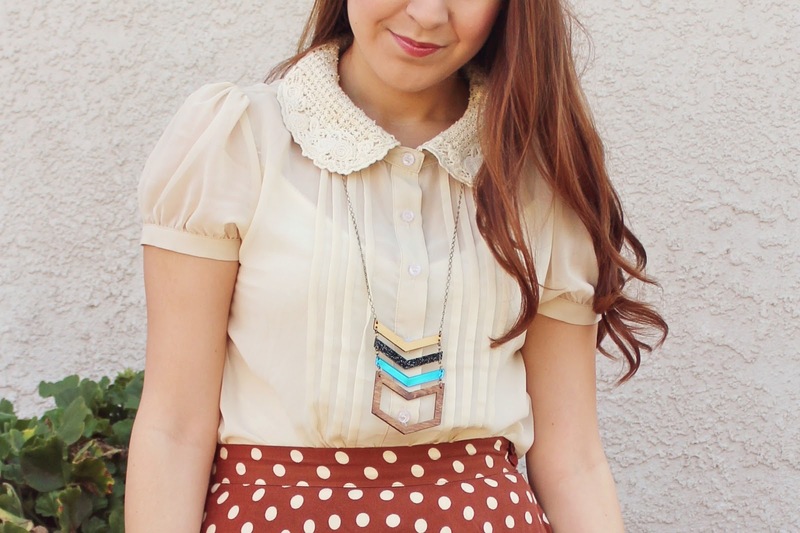 That necklace is lovely and the skirt is so pretty too! Love the Tut's Treasure Egypt Necklace! Congrats on the partnership. ..the necklace is perrty! I really like the brass and turcoise earrings.. I'm following you on gfc and I love the chevron necklace. Wow — so hard to choose, I think I'd pick the Coyote vs Cowboy Necklace.